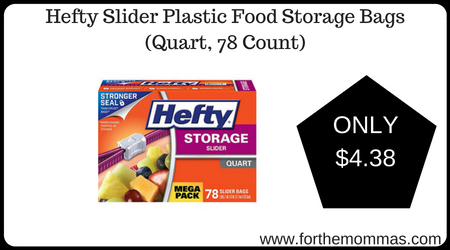 Amazon has Hefty Slider Plastic Food Storage Bags (Quart, 78 Count) on sale for $5.76. In addition, there is a 20% off ecoupon to clip. They ship free, plus you get another 5% off when you subscribe and save, making the final price $4.38 Shipped. If you have 5 subscribe and save items at once, you will save 15% off.